RAF runner James Bellward flew to victory in the Thorney 5 road race on Sunday (August 23). 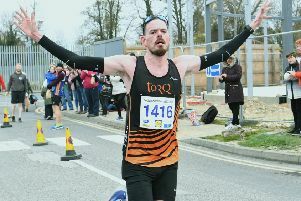 The 31 year-old corporal from RAF Marham clocked 26.47 to pip Peterborough Athletic Club’s Steve Robinson by a second with Nene Valley Harriers youngster Rhys Goddard third in 27:04. Peterborough AC had three other runners finish in the top 20 - Daniel Snipe was 10th, Steve Hall 13th and James Whitehead was 16th - and they won the men’s team prize. First lady home was Nene Valley Harriers veteran Philippa Taylor in 31st place in 30.40 and she led Harriers to victory in the ladies team stakes.